Autumn has already arrived. You can tell be the falling of the leaves from the trees and the browning of them on the vines. It is starting to get cold too and harder to stay out of bed. 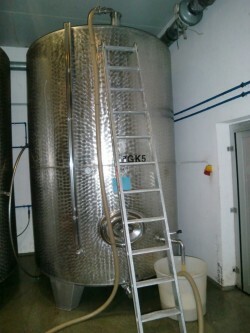 As part of the routine, I made my way to the winery and tasted each tank to check for any off-odours from the wines. I also took the usual alcohol and temperature readings. A few bins of Grüner Veltliner and Riesling came in today. 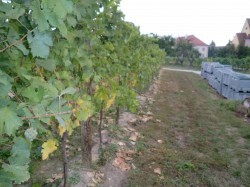 Not as much as last week but we are still expecting more grapes from the Weinviertel region. Those grapes will go into another label which is not under the Salomon name but shall be sold to the supermarkets under another label. The newly-arrived Rieslings were loaded into the press. It was a two-man co-ordination effort to get the grapes loaded. One person would use a fork-lift to lift the bins and the other would be on the top of the press directing the driver when he is in the right position to drop the grapes. 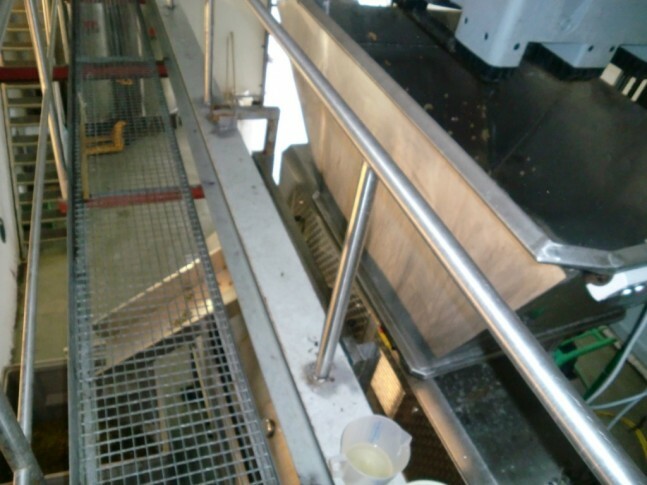 A stick is needed to push the grapes through the crusher/de-stemmer. Sulphur and enzymes were added at the same time. I was sweating as I was guiding the grapes into the crusher. Today, we did some transferring of the wines from the tanks to be filtered and racked. Another tank had a stinky smell to it and we pumped the contents of the tank from the bottom to the top to get some air into it. Eventually, the smell dissipated due to the air exposure. There is some potential for oxidation of the juice if you did this but since the juice was fermenting, it already had a protective layer of carbon dioxide. This is something that would not be common in Australia where oxidation is taboo. I also discovered that the fermenting tank that smelled of tofu came from grape must full of lees. No wonder winemakers don’t like too much lees in their wines! Some cleaning had to be done to the tanks too. I learned that the most important parts of the tank to clean were the hard to reach areas where bacteria can thrive such as the racking valve and taps. This can cause problems to the next batch of wines pumped into the tanks. We tested the re-corked 1969 and it was at the right level of sulphur we wanted in the bottle. Hopefully this will last many more years to come. We transported the 1969s back to the wine cave and this time we took out the 1968s for re-corking. Surprisingly this batch has a much higher ullage on average than the 1968 probably because it was better kept. Tomorrow will be another day of tasting every bottle of 1968 to make sure they are fine. It sounds like fun to taste so much old wine but not when you have to make decisions on whether it should be re-corked or dumped out into the drain. Today, the wine team had the opportunity to taste the Salomon Pfaffenberg 2010 Riesling Kremstal DAC, 12.5%ABV. It was a fantastic wine driven by layers of stonefruit, a powerful nose and aromas of minerality, sweet confectionary and ripeness. The balance in that wine matched the nose in palate. It tasted of ripe peaches and with such a very long length in there. The biggest shock I received was that the wine was opened since the 26th of September and has been kept in the wine fridge since then. From my experience, this is the amazing thing I find about European wines and from my private experiments done on German and Alsatian Rieslings. The Rieslings in Europe, if made from good vineyards with good fruit, can last for days without any sort of argon gas filling or vacuum pumps. Not only do they taste great but can get better when they are opened. They have a tendency to withstand oxidation greater than the wines tasted from the new world where the wines are not exposed to much oxidation from fruit-processing to bottling. Is it the wine-making technique or simply the grapes? I have no fast answers but only a sense of awe about the mystery of such wines.